I saw a version of this recipe floating around Facebook. It purported to originally come from Real Simple, though I never found it on there. The posting I saw called for green beans and red potatoes, but I rarely have those on hand. I do happen to love asparagus, but if you’re not a fan, you can go with the original idea, or substitute any vegetable(s) you prefer. I’ve also made this dish with broccoli crowns. Because I skip the potatoes, I serve this dish with rice. Usually a long grain and wild rice variety. This recipe serves 2, but upscales quite nicely. Arrange the lemon slices so two will fit in a single layer in the bottom of the baking dish, underneath the chicken breasts. In a large bowl, combine the remaining oil, lemon juice, garlic, salt, and pepper. Dip the chicken to coat, and lay on top of the lemon slices in the baking dish. 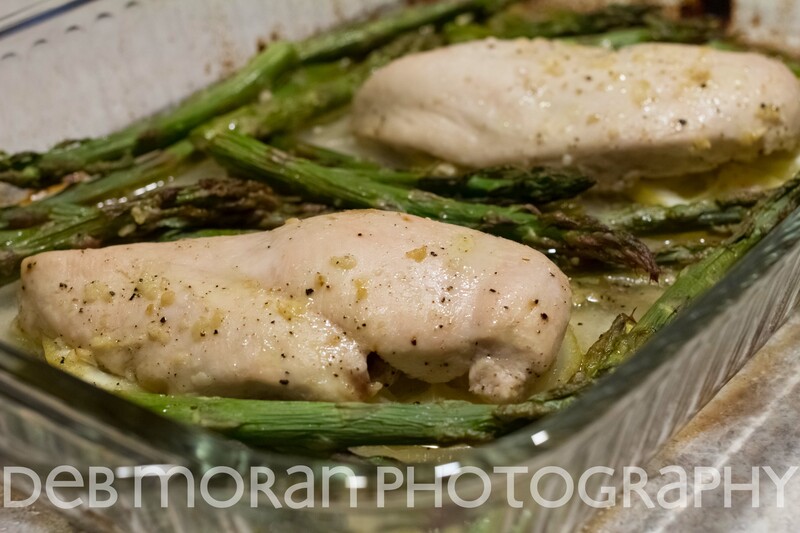 Place the asparagus in the dish, around and in between the chicken breasts. Evenly pour the remaining mix of oil, lemon juice, and spices over the chicken and asparagus. Bake for 35 minutes or until cooked through. Yes, I know the chicken does not look pretty. That’s how real food looks. When it’s all pretty and golden and glazed looking, it’s fake, or at best, gussied up but not really edible. I could have not photographed it just because it wasn’t attractive, but I did, so you’d know what it should look like. And believe me, it’s so delicious! Not to mention healthy!